This site was initially designed in April 2000 for Russell. 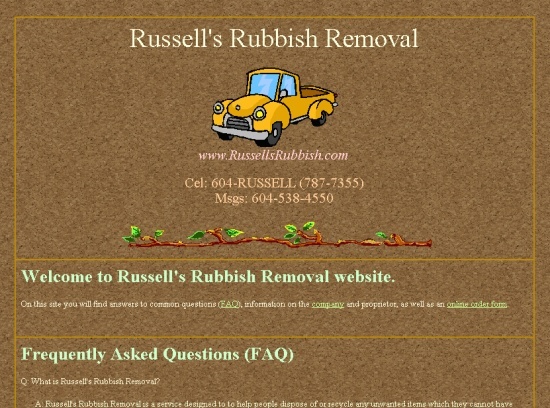 The goal was to have a simple yet effective web presence with a theme appropriate for a small rubbish removal business. The final design was a simple text page with minimal graphics, providing as much information is necessary without forcing the visitor to search for relevant information. Everything at your fingertips; answers and contact infomation together. The site consists of two pages: the main index page shown above, and an online order form. The order form allows potential customers to send details of their service needs direct to Russell who can then contact them after reviewing his availability, and the specific needs of the customer. An update to the site occurred in April 2004, where the following was improved to conform to updated web standards since 2000.